An old British term, spatchcocked, refers to the removal of the backbone of a bird so that it can be flattened prior to grilling or roasting. Today, this is also called flattening or butterflying. The advantages are many and the disadvantages few. The technique has been around for centuries but is enjoying a resurgence as chefs and ‘foodies’ are realizing the benefit of barbequing their turkey on an outdoor grill, while freeing up the oven for other dishes. Besides freeing up space in the kitchen, the turkey will also cook faster, and more evenly, since more of the meat sits closer to the heat. The technique also exposes the bird’s cavity so it’s easier to season, resulting in improved flavour. The down-side of this being that you can’t stuff a flattened turkey, because you’ve eliminated the space where the stuffing used to go. You can overcome this hurdle by cooking your stuffing separately. If you have a local butcher, you may be able to simply order a spatchcocked turkey to go. However, you can also do this at home with a really good knife, sturdy cutting board and heavy duty kitchen shears. First, thaw your turkey per our directions in the Thawing section (Whole Turkey How-To’s). Place the bird breast side down on a cutting board that won’t shift around. Using a very sharp knife or better yet, heavy kitchen shears, cut along both sides of the backbone through the rib cage to remove a strip about 2 inches (5 cm) wide. Then you have a choice. Some people simply flip the turkey over and press downward to break the breastbone sufficiently so that the bird lays flat. This takes a great deal of might with a large turkey, so you may want to try removing the breastbone. Carefully and slowly work a small, sharp knife between the breastbone (keel) and the breast on each side, leaving as much meat with the bird as possible. Now you can also decide whether to remove the ribs as well, which will require a boning knife or a very sharp, thin-bladed knife. All steps of spatchcocking your turkey take some practice, so don’t despair if your first attempt doesn’t turn out too well. Everything you’ve removed can be put in a pot to boil for turkey stock to add to your gravy or a soup. You can wrap the tips of the wings in aluminum foil to prevent burning. Your floppy bird has to be carefully handled as you season it and move it to the grill or oven roast. The cooking time will be reduced by up to 30%. As always, the best way to determine doneness is to use a meat thermometer, placed deep into the meat, cooking the turkey to an internal temperature of 170°F (77°C) in the thigh for an unstuffed turkey and 180°F (82°C) for a stuffed turkey. If barbequing, you want to make sure that you have something separating your bird from the flame, such as a pizza stone. You may also want to include an aluminum pan with ½” (1 cm) of water, stock, beer or wine in the barbeque to keep the air moist in the closed barbeque. Once you’ve finished roasting in the oven or grilling your turkey, allow it to rest for 20 minutes before carving to allow the juices to settle. 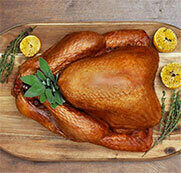 Enjoy your easy-to-carve, moist, delicious turkey!